These mini meatloaves are perfect individual size and they cook in less than 30 minutes! The recipe allows ample flexibility to change the ground meat and vegetables too. Paired with the classic comfort food, mashed potatoes, and it makes a filling and soul-satisfying meal. Preparation timing suggestion: Start the potato water to boil before beginning the meatloaf and boil potatoes when meatloaf is cooking. Mashing of potatoes can be done while the meatloaf sets after cooking and both will be done at the same time! In a large bowl combine the meat, carrots, celery, onion, bread crumbs, egg and ¾ cup of the spicy ketchup or chile sauce so it is all incorporated. Add mixture to 12 muffin tins (fill but do not pack down). Spoon the remainder of the spicy ketchup or chile sauce (about ¾ cup) over the top of the little meatloaves. Bake for 25 minutes. Remove from oven and allow to sit 10-15 minutes following baking to ensure they stay intact when removed (you can remove them earlier but they will not stay in one piece). Place the potatoes in a large pot of cold water and bring to a low boil. Boil for 20 minutes (or until potatoes are cooked through). Remove from heat, drain and return potatoes to cooking pot. Add butter and bury under potatoes to allow it to melt. Add milk and using a potato masher, ricer or in a food processor, mash potatoes until smooth with no lumps. Add salt and pepper to taste. 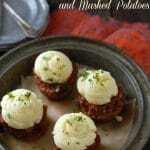 Place mashed potatoes on top of muffin tin meatloaf and serve hot! Garnish if desired with chopped Italian parsley.